Grévin’s first employment was with the French railway in Lyon. He was, however, a gifted draughtsman, and decided to give up his railway job and move to Paris. 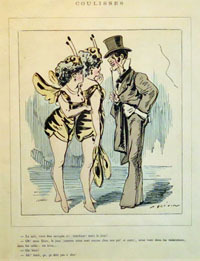 There, in 1859, he found work as an illustrator and caricaturist for two Parisian satirical newspapers: Journal Amusant, and Le Petit Journal pour rire. His success was immediate and he was soon one of the most sought after Parisian illustrators. He also designed costumes for the Paris theater. 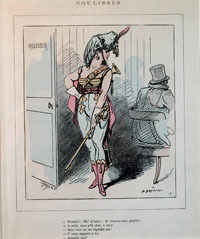 In 1877, with the writer Ernest d’Hervilly, he wrote a play, Le Bonhomme Misère (My Good Man Misery) which was produced at the Odéon Theater. In 1882 Grévin was one of the founders of the museum which bears his name and of which he was the first director. Le Musée Grévinthe wax museum of Paris, is as popular an attraction today as it was in the last years of the 19th century. 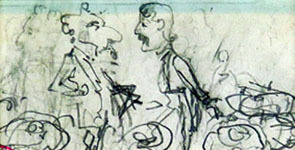 In 1999, the Galerie Jouffroy, near the Musée Grévin, held an exhibition of the watercolors and drawings of Grévin. The following works were in that exhibition. All have been professionally de-acidified, some left on their original mounts.